A beautiful & unusual pair of antique glass chemist advertising carboys. A fabulous & unusual pair of carboys which would have graced the window of a Victorian chemists as part of an eye catching advertising display. Hand blown with ground pontil marks to the bases & cut glass stoppers, the carboys are smaller than usual & the perfect size for home use. Wear commensurate with age, excellent overall. 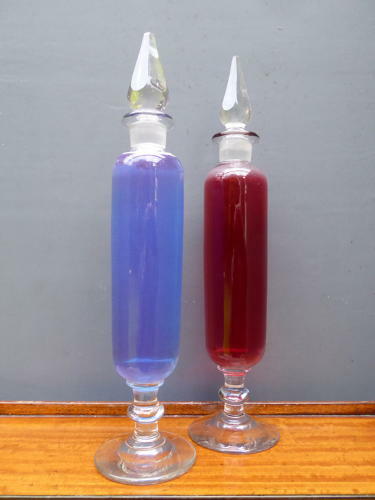 The bottles were filled with coloured water for the photo shoot & will be supplied empty.